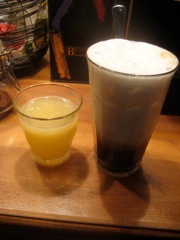 April 16, second breakfast. 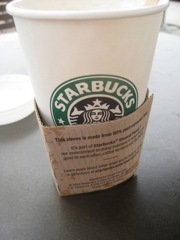 A cappuccino from Starbucks. Had to take Jan into see her doctor and so I killed time up there during the visit. 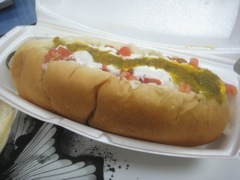 April 16, lunch. 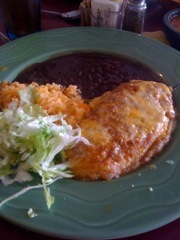 Chile rellenos from Mosaic Cafe 2 up on the Northwest side. This is a consistently good Mexican restaurant that really knows how to make delicious food. Highly recommended if you get stuck near the Foothills Mall and need a good meal! 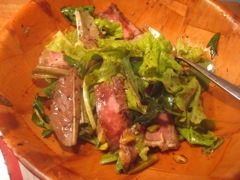 April 16, dinner. 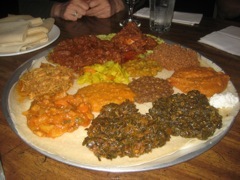 Friday night at Zemam's. With Jan, Rose & Mark. 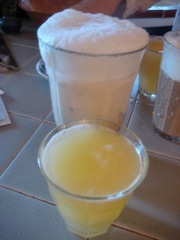 April 17, breakfast. The usual. April 17, lunch. 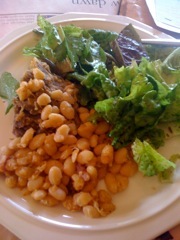 Last of the leftover Cassoulet, with some green salad from Jan's garden. At home with Jan.
April 17, dinner. 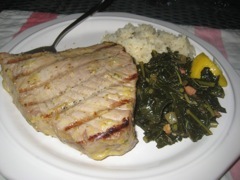 BBQed tuna, grilled to perfection with a bit of a citrus taste. Greens fresh from Jan's garden. Some white rice. All over wonderful. At home with Jan in Tucson. 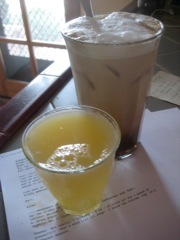 April 17, dessert. 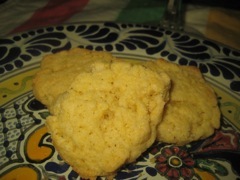 Some little cookies. 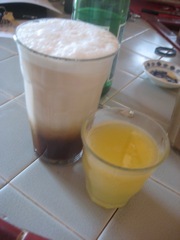 April 18, breakfast. The usual. April 18, lunch. 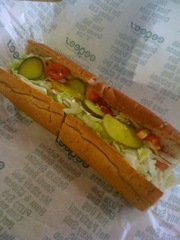 A sandwich at Eegee's, with the TOPCU guys. Good for fast food, bad for food. Kept us going during a long network upgrade. With Matthew, Jan, and Rick. 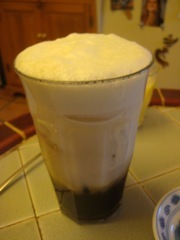 April 19, breakfast. The usual. April 19, snack. 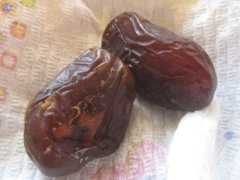 Some dates. 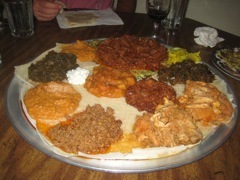 April 19, dinner. Chicken, grilled by Jan. Asparagus, greens. Lovely! At home with Jan.
April 20, breakfast. The usual. April 20, lunch. 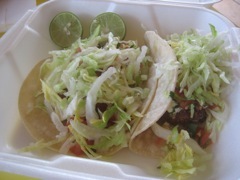 Two fish tacos from Nico's in Tucson. With Jan. The fish tacos there are pretty good; they always fry the fish, so if you don't like that, don't go. But the "crema" sauce is tasty and has a nice tangy bite to it. Sometimes it's better than other times. I wouldn't go there if you were craving fish tacos, but if you try 'em, you'll be happy. I am. April 20, dinner. 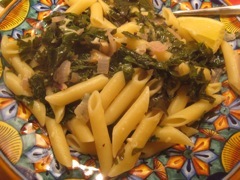 Penne broccoletti, with greens from Jan's garden. Not the best dish we've ever made, but I think that the broccoletti was not at its peak. A bit "stalky" and not enough leaf. April 20, dinner. 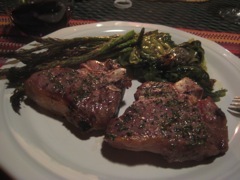 And grilled asparagus. On a different plate, as Italians would require. At home in Tucson with Jan.
April 21, breakfast. The usual. April 21, lunch. Mr. K's BBQ in Tucson, with Jan and Matthew. 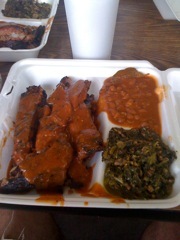 Ribs, greens, and beans. A meal fit for a (slightly overweight) king. The best BBQ in Tucson, absolutely. April 22, lunch. 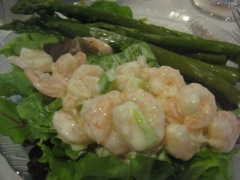 A salad from Jan's garden. April 22, dinner. At Santa Catalina Villas with my mom and Jan. This was the salad bar, where they had some nice shrimp salad. April 22, dinner. At SCV with mom and Jan. 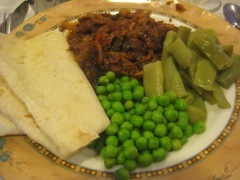 This was pulled pork, with green beans and green peas, and a tortilla. April 22, dessert. 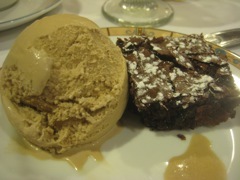 A bit of brownie and some ice cream. April 23, lunch. 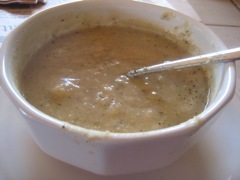 Potato and Horseradish soup, from a jar. As expected. At home with Jan in Tucson. Don't do that again. April 23, dinner. 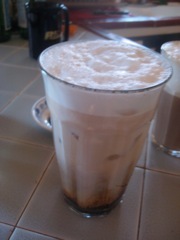 Zemam's with Jan, Rose, and Mark! Yay! April 24, lunch. 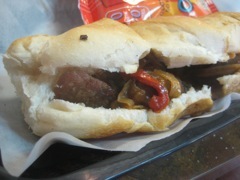 A sausage sandwich and chips. April 24, dinner. 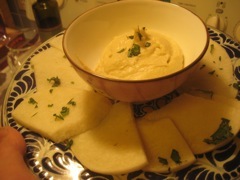 An appetizer of jicama to dip into hummus. The funny thing is that both start with the "H" sound, yet they're spelled differently. What's up with that? April 24, dinner. Jan's chard rolls, stuffed with meat. On the side, a tomato salsa with some fresh parsley. 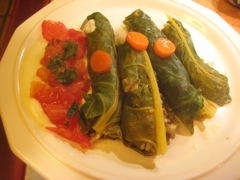 On top, a bit of the carrots the chard rolls were cooked in. 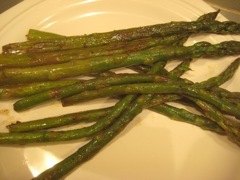 These are put ON the stalks to keep them out of the braising liquid and then oven braised for a while. Very tasty! At home with Jan. With Outis (Etna D.O.C Rosso) wine. 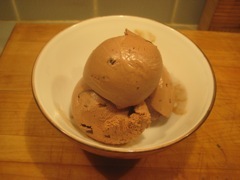 April 24, dessert. Ice cream!